Menashe Kadishman is a prestigious Israeli sculptor and painter and recent recipient of the The Israel Prize for Sculpture. His pieces can be seen in many places around Israel and the world. Kadishman’s signature style is marked by his exquisite drawings and sculptures of sheep. The whimsical depiction of sheep represents Kadishman’s childhood profession as a shepherd. Kadishman uses that knowledge as well as his experience with nature, sheep and shepherding to convey his artistic expression. 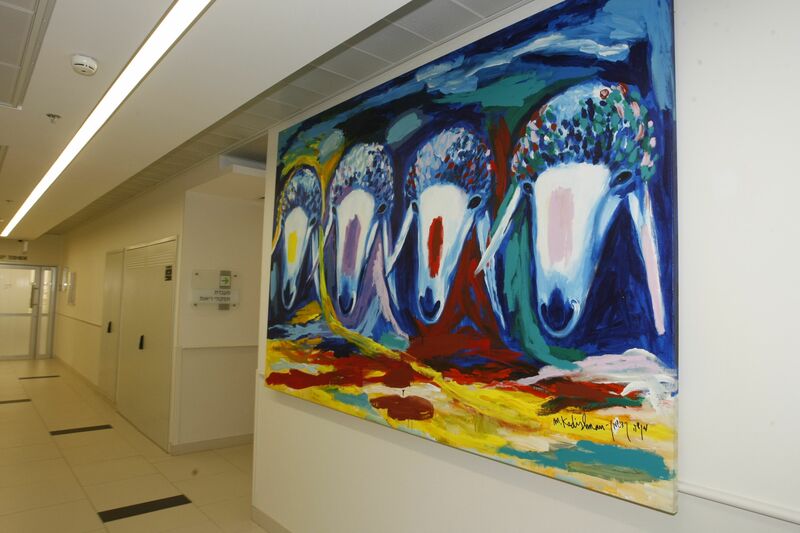 Menashe Kadishman piece in Rabin Medical Center hallway. Most recently, he has also donated 18 of his magnificent works of art to the opening of the Institute of Pulmonary Medicine at Rabin Medical Center. The donated pieces elevate the style and atmosphere of the new institute. It resembles a remarkable art exhibition that is full of color and optimism.